from 15 pcs. 0.98 CHF ea. from 40 pcs. 0.88 CHF ea. from 80 pcs. 0.82 CHF ea. 5 pcs. 1.64 CHF ea. Here a test with a S-15-08-N: The adhesive force perpendicular to the surface is 6.7 kg. The adhesive force in shear direction is only 1.45 kg. 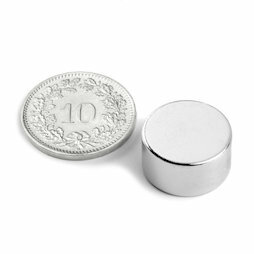 With a self-adhesive silicone disc between magnet and steel plate (practically invisible because it is black and only 0.5 mm thin) the disc magnet can hold over 3 kg in shear direction; then it starts to slide down.